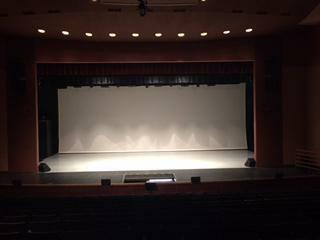 Custom Built Wall Hung System Stage Right and Stage Left of proscenium. House mixer is a SoundCraft GB4 32/4 with full processing support. Two dressing rooms, each accommodating approximately nine people per room; additional group dressing available. Pianos Available: 1 - Baldwin 9' concert grand piano. 400 AMP 3° 5 wire with Cam Locks Stage Right and 100 AMP 3° 5 wire with Isolated Ground Stage Left.